Today is a sad day for fans of all sorts of entertainment. Whether you were into Star Trek, Columbo or Three Men and a Baby (among many other endeavors), Leonard Nimoy was an omnipresent part of American entertainment over the last half century. Today, this entertainment icon passed away, and leaves behind an indelible legacy of work in front of the camera, behind it and beyond. To keep within the theme of this blog though (tangentially, at least, keep with me), I want to talk about his most memorable (and from what I know, favorite) character: Star Trek’s Spock. Without Star Trek, it’s debatable whether this site would exist today. When my four year old self changed the channel to a Star Trek rerun in 1977, and I saw that amazing ship fly past the screen, I was forever hooked onto the idea of ships sailing through space in search of new worlds and new life. It didn’t hit me until I was older that Star Trek wasn’t just about the ship or where it went, but the crew that inhabited her, and no character in that fantastic ensemble was more fascinating than Spock. Half human, half Vulcan, while he professed the coolness of logic, he could be as caring as any human. The fact that humans and aliens worked so closely together toward common goals and forged friendships that would last for years was wonderfully hopeful, looking toward a better future not just for us, but for whatever alien life we might meet along the way. It took me even more time to realize just how important Spock was not only as a character, but as an evolution to the idea of an alien in science fiction. Before Spock, many of the aliens on movies and television were monsters to be destroyed or conquerers to be feared. The Terror from Outer Whatever or the Thing from Space or what have you. Spock showed us an alien that we wanted to hug (or as my friend Joe says, engage in a friendly round of 3D chess). Spock would be there to help us solve problems, to help us through our darkest hours and to be the ear we needed to listen to our issues. I truly think that, without Spock, science fiction would have a much harder time finding as wide an audience as it has today. His character, and Nimoy’s exceptional portrayal of him, showed us that science fiction doesn’t have to be scary or gross. He showed us that the future can be beautiful, exciting, and totally fascinating. I mean gosh, even the jocks who gave me crap about liking science fiction in school knew who the hell Spock was. His character transcended the genre and really showed what a more hopeful, more enlightened future could be. If it wasn’t for Star Trek, and excellent characters like Spock, I’m not sure if I would have the deep and unending love of Science Fiction I have to this day. I’m not sure if we would have had such awesome and friendly aliens that followed like Chewbacca or George Francisco or Grig. I’m not sure if we would’ve had massive conventions all over the world not only for this show, but for geekiness in general such as Comic-Con. So yeah, I think we owe a lot to Spock. Regardless of how Gene Roddenberry envision him or others wrote him, it was Leonard Nimoy that brought him to life and really helped make him so beloved. 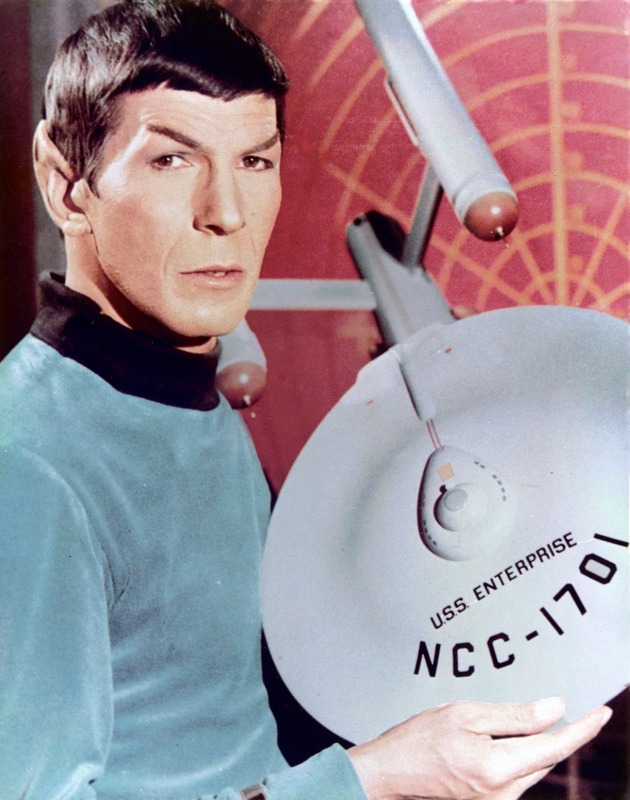 Thank you, Mr. Nimoy, for such a prosperous career in which you worked for our entertainment. You didn’t live long enough, in my opinion, but you sure seemed to have a hell of a life. May you rest in peace. Also, please say hi to Jimmy and DeForest when you get up there. Oh my this is the first I have heard this news reading it here on SGJ. Very sad. In so many ways he and the Star Trek team are a role model for my interest in all things space and represented a better more positive path for humanity. I really hadn’t thought about Spock as one of the first aliens to really make us think of aliens as potential allies. I don’t have the historical knowledge of sci-fi to confirm or deny that theory, but I do know that the network was worried about Spock looking too much like the Devil. Roddenberry stuck to his guns on this a bit, though he did soften the eyebrows compared to the pilot. I think Spock’s devilish look combined with his utterly rational approach to life and, to borrow from Kirk, ultimately ‘most human’ qualities…well, together this creates a great early example in my own life of not judging a book by its cover. This was a HUGE lesson on Star Trek in general, and yeah Spock is one of the main examples of it. So I have to agree that the character of Spock, as portrayed by Nimoy, is one of the first (perhaps the first) example of how the universe could be a new source of cooperative friendships rather than a scary place. Interesting article. Another member of the crew passes on. Star Trek Spock was a massive influence upon me as a child and still is as an adult. The chemistry of Kirk, Spock and Bones was perfect. A sad day. Beautiful written. Star Trek was one of the shows that I fondly remember after immigrating at a young age to America. I made many a paper Enterprise model in 3rd grade. LLAP. Great post. Definitely in the heart of every sci-fi lover, there’s space there for Spock/Nimoy, alongside all the great authors & dreamers who have made the genre what it is. Amazing post. Star Trek was my intro to science fiction. Without Star Trek there is no way I would have spent half my life dreaming about and pretending to be a starship commander. Star Trek and Star Wars completely dominated my imagination and play as a kid. Previous story February, 2015 Game of the Month – Homeworld: Cataclysm – Entry 2 – Upgrade What Now?